Every managing director you speak to says that they put their customers at the heart of their business. Even though they probably believe that this is true, most of the time it isn’t. Now we’re not pointing fingers here because it’s not because they don’t try; often, managers don’t have the right information and tools to really understand their customers or to see where business processes fall down. This is especially true in larger enterprises where departments tend to function with little or no interaction. But it happens in SMEs all over the land too – departments working in silos with no idea what their colleagues across the business are doing. With a CRM solution that joins up marketing, sales, finance and customer services, this doesn’t have to be the case. “Two years ago, the percentage of companies that put themselves in the category of “extremely” customer-driven was 48%. Today, it’s 63%, and looking into the future two years down the road, 81% say their organizations will be “extremely customer-driven”. The latest buzz phrase in business is ‘Voice of the Customer’. A recent article in CRM magazine, Listening to the Voice of the Customer, looked at the solutions that smart companies are now using to gather customer feedback. These solutions are all about joining up all your business processes so that you get a holistic view of each customer’s entire experience with your company. In a nutshell, exactly what the right CRM system does. Why is putting customers at the heart of your business so important? Your customers’ relationship with your company is with every department. So although your teams work separately, to the customer they are one homogenous representation of your business. If you haven’t got all your business processes integrated, your sales rep could get on the phone to a contact to try and get them to commit to something without realising they have raised a complaint with customer services. Your company looks stupid and a customer who was already disappointed with your service has just got unhappier. 55% of consumers would pay extra to guarantee better service. A customer is four times more likely to defect to a competitor if the problem is service related than price or product related. 68% of customers leave because they were upset with the treatment they received while speaking to customer services. The probability of selling to an existing customer is 60 – 70%. The probability of selling to a new prospect is 5-20%. Everyone likes to think of themselves as special, and their problems unique. If your customers discover that they are just one name on a long to-do list being passed around countless departments, they will realise that your company isn’t taking their problem as seriously as they are; and that they are just a number in a system, not a valued relationship. According to Bain & Company, increasing customer retention by just 5% can increase profits by 25% to 95%. If the sales team don’t know that marketing are sending out a special offer campaign, they could ring a customer who’s just received it and try to sell them the product or service at full price. Ouch. If customer services don’t know that Company A hasn’t paid any of its invoices then they could promise them support or replacement products that Finance are not happy to give. A typical company’s customers leave at a rate of 10% to 30% per year, according to Frederick Reichheld’s book The Loyalty Effect. We could go on, but we’re sure you’re getting the picture. With the right CRM system you can ensure that these kinds of things don’t happen in your business. 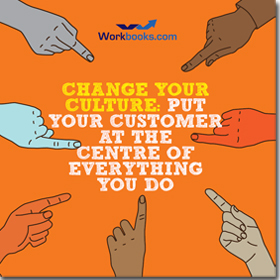 You can transform your company culture so that all of your teams can see, track and monitor every interaction a customer has with your business. You can turn them into one big team working together to deliver better customer experiences, which delivers more repeat business, which then turns into more revenue. That’s why it’s so important. Want to find out more about streamlining your business processes with the right CRM system to enable your team to deliver a more customer-centric experience? Download our eGuide: ‘Dance to your tune: how to get your team excited about a new CRM implementation’.